Each: 20 by 20 in. 50.8 by 50.8 cm. 12 by 14 in. 30.5 by 35.6 cm. 8 3/4 by 13 1/2 in. 22.2 by 34.3 cm. image: 7 3/16 by 5 in. 18.3 by 12.7 cm. NEW YORK, August 19, 2014 – Mitchell-Innes & Nash is pleased to announce Days Inn, a group exhibition curated by Justine Kurland, on view at the gallery’s 1018 Madison Avenue location from September 4 – October 10, 2014. Days Inn includes photographs, prints, and mixed-media installations dating from the 1940s to the present day and focuses on the idea of a roadside motel as a metaphor to explore varying contradictions in everyday life. The idea for the exhibition stemmed from Kurland’s own investigation into the medium of photography and its ability to document reality, while offering new, paradoxical, and often ominous meanings. The exhibition will coincide with the third solo exhibition of Kurland's own work, titled Justine Kurland: Sincere Auto Care, on view at the gallery’s Chelsea location at 534 West 26th Street. Days Inn includes works by: Louise Bourgeois, Jay DeFeo, Samuel Fosso, Chris Johanson, Virginia Overton, William Pope.L, Ed Ruscha, Cindy Sherman, Mamie Tinkler, and Gillian Wearing. The artists in this exhibition deal with everyday objects, documents, and signs whose meaning confront the enigma of experience. These works rest inside of a contradiction— they authenticate reality while animating it with an unhinged and fugitive spirit. Ed Ruscha’s Oh can be read with many different intonations, from boredom to arousal to surprise, but it remains, after everything else, the description of a shape. The indecipherable chart, Value (2012), painted by Chris Johanson, counts down the days while the prison-like-child-like lines undercut their own bureaucratic authority. In her graph-paper drawing, Untitled (1949), Louise Bourgeois’s nervous scratchings suggest skeletal forms, like drapes or stage dressings that once held something voluptuous. A stack of photographs of domestic floral design, possibly studies for future works, are strewn on a table, making an automatic collage in Mamie Tinkler’s watercolor Still Life with Photographs (2012). If you’ve ever looked at yourself in the bathroom mirror of a Days Inn you might have felt the urge to take off your shirt and posture the kind of tragedy the décor suggests. Like some B horror film or 19th century spirit photography, Cindy Sherman poses self-consciously in her overwrought film still, Untitled (The Daughter) (1976/2000). Samuel Fosso’s Self Portrait (1975), which was originally done to use up the unused film from his commercial gigs, casts himself in an unapologetically theatrical role. His palm is up, as if frozen in mid-dance-step or simply saying “hi.” In A Woman Called Theresa (1998), Gillian Wearing chronicles the brutal relationships Theresa has with men for alcohol. We see Theresa tenderly held by a man who describes her cruelly in the accompanying text. Similarly, Virginia Overton’s Untitled (Sandbag) (2012) focuses tension on a string where an object that floats is tethered to an object that sinks. William Pope.L’s Intimacy Project (2011) presents a progressive record of trauma and accident. The face of an older woman (his grandmother) is marked by the indentation of a fist. This new grandmother is the combination of what she was and what she is now—carrying on as the fist-punched grandmother. In Jay DeFeo’s Untitled (1972) we are given the mute and formal beauty of a pay phone, a secular confessional device to pour quarters into, to press the plastic receiver to your face and pray that you are heard. The Days Inn motel offers the Kings James Bible, 29 channels of TV, and free Wi-Fi as well as making sure all light fixtures and appliances are securely attached to the wall. Overton’s Gentle Ride (2013) offers an alternative to the roughness of the everyday. It suggests that we might try to take it easy. 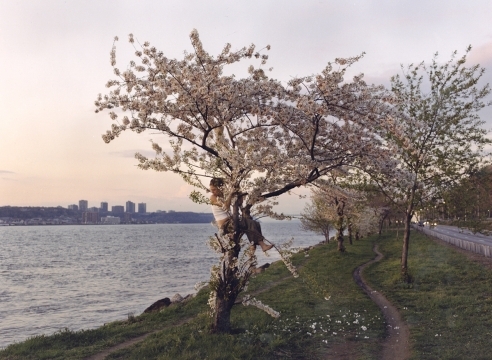 Justine Kurland was born in 1969 in Warsaw, New York. She received her B.F.A. from the School of Visual Arts (SVA), NY, in 1996, and her M.F.A. from Yale University in 1998. Her work has been exhibited extensively at museums and galleries in the U.S. and internationally. Recent museum exhibitions have included More American Photographs, Wexner Center for the Arts, Columbus, OH; Off the Grid #1 and Off the Grid #2, Fotodok, The Netherlands; The Kids are All Right, Addison Gallery of American Art, Andover, MA, which traveled to John Michael Kohler Arts Center, Sheboygan, WI, and Weatherspoon Art Museum, NC; America in View: Landscape Photography 1875 to Now, RISD Museum, Providence, RI. Her work is in the public collections of institutions including the Whitney Museum, the Guggenheim Museum, and the ICP, all in New York; the Corcoran Gallery in Washington, DC; and the Museum of Fine Arts in Montreal.